The Congressional Club Museum and Foundation is a self-supporting nonprofit initially incorporated by Congress to be a non-partisan setting for wives of members of the House and Senate living in Washington, D.C. Today, the Club continues its distinguished tradition of fostering friendships among the Nation’s leaders and their spouses while also serving as a museum and destination for social occasions. The first President of The Congressional Club was Mary Martindale Perkins of New York. She and 30 women formed the first membership nucleus in 1908. The Clubhouse was dedicated in 1914 with a formal reception at which President Wilson was the guest of honor. The First Lady’s Gown Collection was donated in 1961 by Baron Langer Von Langendorf, best known for creating the White Shoulder perfume. Miss Evyan of Evyan Perfumes created the 48 inch Lady like dolls originally known as the Evyan Collection of One hundred Years of Great Lady Fashions. On February 26, 1962 The Congressional Club Museum and Foundation was incorporated in the District of Columbia. Since the Museum’s original dedication, the designer of each First Lady’s Inaugural gown has donated to the collection. 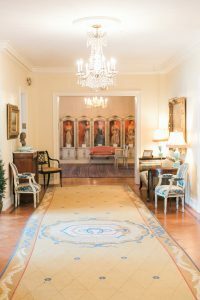 The Congressional Club Museum and Foundation proudly showcases designs by James Galanos, Harvey Berin, Carolina Herrera, Oscar de la Renta, Jason Wu and Hervé Pierre. The Museum is open weekdays by appointment free of charge.